I've had a lot of support for the project, from lots of people, and it's all been very exciting. Some people have searched for any Guttenberg film, and some people have been keeping their eyes open for one particular film. Sarah is one of the second group. And which film was it that she was looking for? But strange motives for purchases aside, her own personal mission means that we can tick another box on the Guttenberg mission. Released in 1997, this is a weird mix of CGI and live action. It begins with a train journey with young Casper trying to figure out what's going on and where he is. Because he is a dead little boy who doesn't realize that he's dead. Clearly, the perfect beginning to a children's movie. Steve plays the father of the kid on the front. He is a BAD DAD. He's an architect who is trying to revitalize his town by pulling down haunted old abandonded mansions and put up strip malls. Lori Loughlin, also known as television's favourite Aunt Becky, plays the kid's teacher, who is violently opposed to the pulling down of haunted old abandonded mansions and putting up strip malls. Will these crazy opposites attract? Oh, I think they will. There's a LOT of overacting in this movie, but from everyone, so we can't really place the blame on poor Steve Guttenberg. It ends up with everyone living happily ever after and no one pulls down the haunted old abandonded masion. Steve as a BAD DAD who is reformed by a ghost: Priceless. I was recently back in Toronto, and met my good friend Aaron for lunch. Aaron has been very supportive of the mission. But there's supportive, and there's supportive. He presented me with this little beauty, and I was ever so touched. 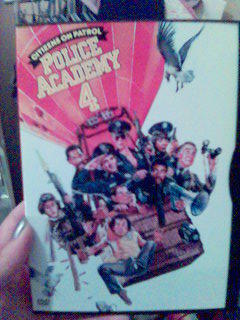 Now, I was of course thrilled to receive Police Academy 4: Citizens on Patrol, but after the painful viewing of the third installment in the series, I was concerned. Could I make it through this movie without wanting to gouge my eyes out with a fork? I was a little concerned, but decided to risk it. An opening rap. An interesting choice. It’s that young Tackleberry kid from Police Academy 3. Continuity! David Spade! In hot pink!!! And he’s a skater!!! This could NOT get better. Is this supposed to appeal to the “kids”? Touching reunion between Harris & Mahoney. Ooh, conflict! Oh the elderly. Always good for a laugh. Why is Sharon Stone shouting her lines? Harris in charge? Oh, I suspect there will be hi-jinks! Wet t-shirt on Callahan. Classy. If there is a Bobcat Goldwaith romance movie, I will VOMIT. There’s nothing funnier than a fat guy dancing. Hey, aren’t there supposed to be “citizens” in this movie? Only 50 minutes in. Huh. Seems longer. Oh, thanks god. The Bobcat Goldwaith kiss was thwarted. I was going to have to vomit. I have a fondness for the actor who plays Proctor. I’m not proud, but there it is. Hey! Continuity! What a wacky idea! Wait – are those ninjas? A hot air balloon chase. Well, I guess I haven’t seen that before. And a closing rap. Sure, why not? I have to say, I was somewhat pleasantly surprised. It's not a good movie, but it's not terrible. Steve is once again likable as Sgt. Carey Mahoney. Sharon Stone's presence is mystifying, until you realize that she was a good three years away from anything close to stardom. There are extras on the DVD, but I can't bring myself to watch them yet. But I'm sure that "Remembering A Lofty Investigation" will provide much insight into the making of this classic. All in all, not the worst movie I've seen this week. And that's not such a bad thing. Seriously, A Hot-Air Balloon Chase? : Priceless.